In April 2012 Kilmaley Meitheal sponsored the training of two Community First Response (CFR) Instructors, who have since been running training courses at Kilmaley daycare centre. There has been a great response by the parish, with sixty-four community first responders having been trained in our community to date. A CFR is trained to deal with life threatening emergencies such as cardiac arrest, choking, heart attacks and strokes. Our aim is to train as many people as possible to act early when faced with life-threatening emergencies. Administering good-quality CPR and confidence using an AED/defibrillator are important steps in the “chain of survival”. The course is overseen by the Irish Heart Foundation and PHECC (Pre-hospital Emergency Care Council). It lasts for 6 hours and is presently being divided into two 3-hour weeknight sessions. A nominal fee of €10 will apply per person to cover costs. 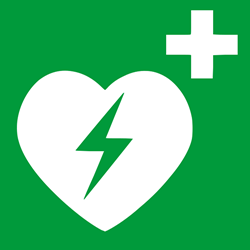 This fee and all donations to the AED Fund are being spent on maintenance of our two community AEDs and the purchasing of training equipment, which is currently on loan. In addition, our aim is to purchase a third AED in the near future, which will be housed in Inch. Training is ongoing and highly recommended. Tuesday 16th and Wednesday 17th June 2015 at Kilmaley Daycare Centre, 7–10 p.m. Participants will learn to deal with life-threatening emergencies such as cardiac arrest, heart attack, stroke and choking. Registration is as 6.45 p.m. on the Tuesday. The nominal fee of €10 per person includes a face mask. EIlish on 087 974 2162.